Our feet go through a lot of hardships throughout the day. Feet endure our whole weight and also experience a lot of sweat whenever we go for a walk or when we wear joggers. In summers our feet suffer from sweat and a bad smell of sweating. While in winters due to cold weather our feet suffer from cracked heels, peel off skin, bad toenails which also imprints our bitter impression on others. They also become tired of our habit of wearing high heels and other different sorts of uncomfortable shoes. But if you don’t pay proper care and attention to your feet you will have to face numerous problems regarding feet and toenails and other health issues. If you want to have pretty toenails and worried about your feet you should take extra care of your toenails. With a little effort or spending a few minutes daily on your feet care treatment makes your toenails beautiful and elegant. And makes you look more healthy and beautiful. Here are some of the top 10 awesome and amazing tips to have pretty toenails easiest methods to make your feet and toenails look clean, smooth and beautiful. The first and best key to protecting your feet and toenails is that you should keep your feet clean every time. For this reason, you should wash your feet on a daily basis and should hard file dead skin to get soft smooth and beautiful toenails. When you wash your whole feet then also wash toenails with the help of the brush. This kind of cleanliness is very necessary for the beauty of toenails. When you keep your feet wet then such feet gives an open invitation to infections and other fungus diseases around fingers and toenails. To prevent such kind of infections let you keep your feet dry. Some people experience a lot of sweating then for these people this simple and easy tip is a blessing. Pour a small amount of telecom powder or baby powder on your feet and spread it. It will help prevent sweating and bad smell. Always dry your feet after washing them or after moisturizing them. For better-looking toenails moisturize them with petroleum jelly, Vaseline, glycerine or you can also apply essential oil to moisturize toenails. Because with the passage of time toenails gets hardened. When they are moisturized it help prevent nails from chipping. Also softens the cuticles. Your toenails look better. If you want sharp and clean white toenails then try to trim toenails properly otherwise it will lead to ingrown nails which are really painful. During trimming your toenails these things should be kept in mind. 1. Never ever let the sides of your nails leave in round position. 2. Always cut your nails in a straight position not round. 3. Never cut your nails too short as this can leads to the development of ingrown nails and causes infections to proceed. Try to arrange a pedicure at home or at a salon where you feel comfortable. Pedicure in a week is essential to keep your feet and toenails look smooth and beautiful. Pedicure contains all the treatments which your feet required. When you spend a lot of money on buying shoes for you then the money you spend on pedicure would not be wasted and your feet will become beautiful enough to wear every kind of shoes and sandals. When you feel tired of wearing closed shoes like joggers and fed up of cracked heels due to the cold season then sooth your feet by dipping them in warm water.you can do this treatment for 10 to 20 minutes in a week. This will make your skin more smooth and soft. Different colors of nail polishes can be applied on your nails to make your toenails looks beautiful. There are a variety of shiny and elegant colors. You can choose according to your taste. Take good care of your toenails. Like trimming your nails on time, pedicure properly and hot water treatment. In case of any infection or ingrown toenails visit the doctor immediately. You should massage your feet to get rid of tiredness and fatigue of daily busy routine. For this reason,n you can use some sort of essential oil to make you feel relax. This technique not only helps you to feel tiredness free but also improves blood circulation and increase immunity. Hence this is good from a medical point of view. 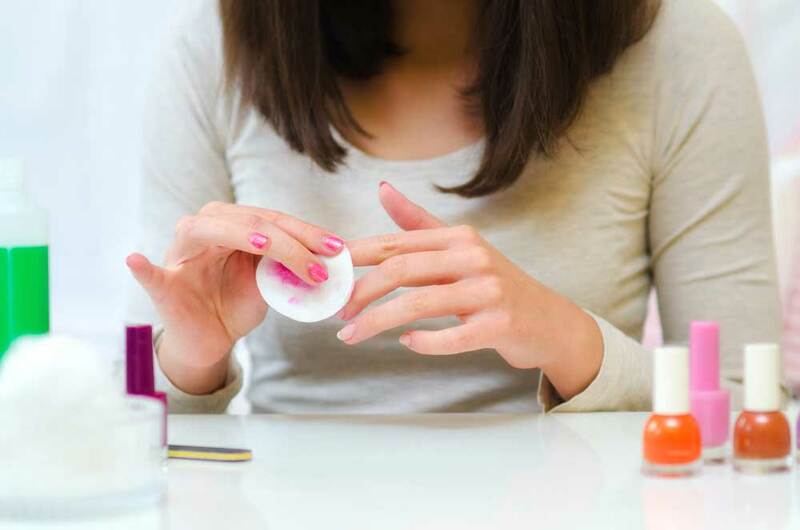 When you remove your nail polish with nail paint remover containing acetone it will make your toenails become harder and lead them to the process of cracking. So try to avoid such kind of removers. Use acetone free nail paint remover to keep your toenails softer.